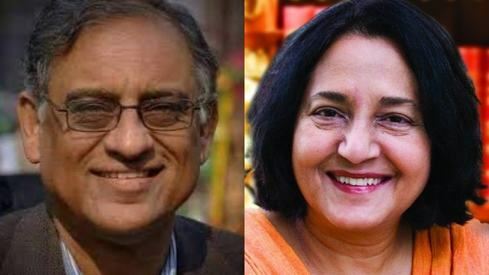 Here's what books were launched and what was talked about on the third and final day of the literature festival. 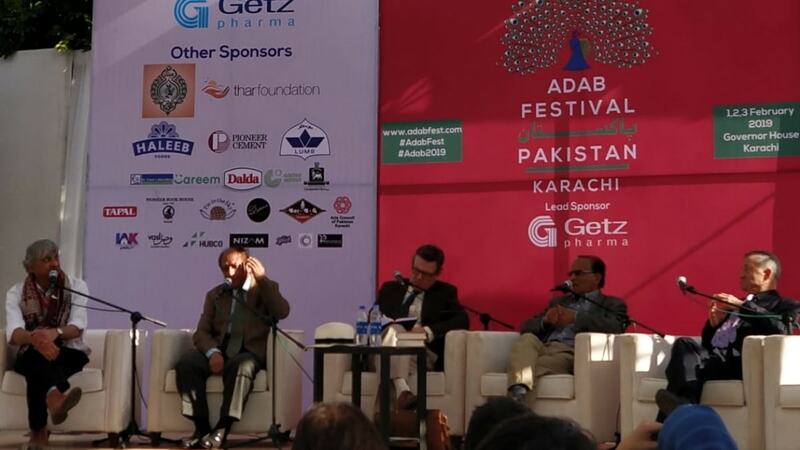 Adab Fest concluded on Sunday with its much hyped puppet show and a host of sessions that touched upon education, military rule in Pakistan, Islamaphobia in the West and women's rights, among others. In the festival's second talk about the recent unprecedented progress in US-Taliban talks, author/journalist Ahmed Rashid credited Trump for his initiative to withdraw troops from Afghanistan despite opposition from his administration, even if it is to fulfill his promise to his voters before the next election. He said that there's a growing awareness in Pakistan too for the need to war to end, especially since the presence of Taliban leadership in the country doesn't bode well for CPEC and other investment opportunities. Talking further about Pakistan's role in the US-Taliban talks, he said, "Pakistan is the most hated country in Afghanistan due to the perception that we've been supporting the Taliban. We have to win over the hearts and minds of people in Afghanistan." 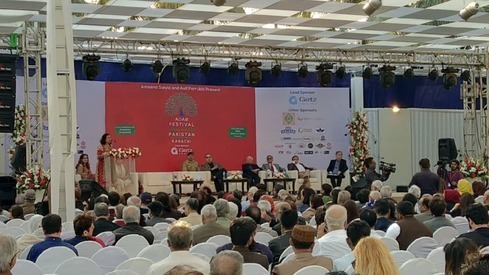 He stressed that Pakistan also needs to drop its obsession with India, saying that India and Afghanistan's relationship is enmeshed in its history of trade and cultural exchange (Bollywood movies, etc) and not possible to break. When asked about whether peace can return to Afghanistan, he said there was exhaustion and massive casualities borne by both Taliban and the Afghanistan government but in order for peace to return, regional countries need to stop interfering by funding and equipping one faction against the other. Lt Col Ian Vaughan-Arbuckle retraced his memory to the time of his appointment in the British army, when he came to Karachi. Having been the capital, the city was clean and safe, heavily policed and low on crime. To walk the audience through it, his conversation was accompanied by a slideshow of pictures. 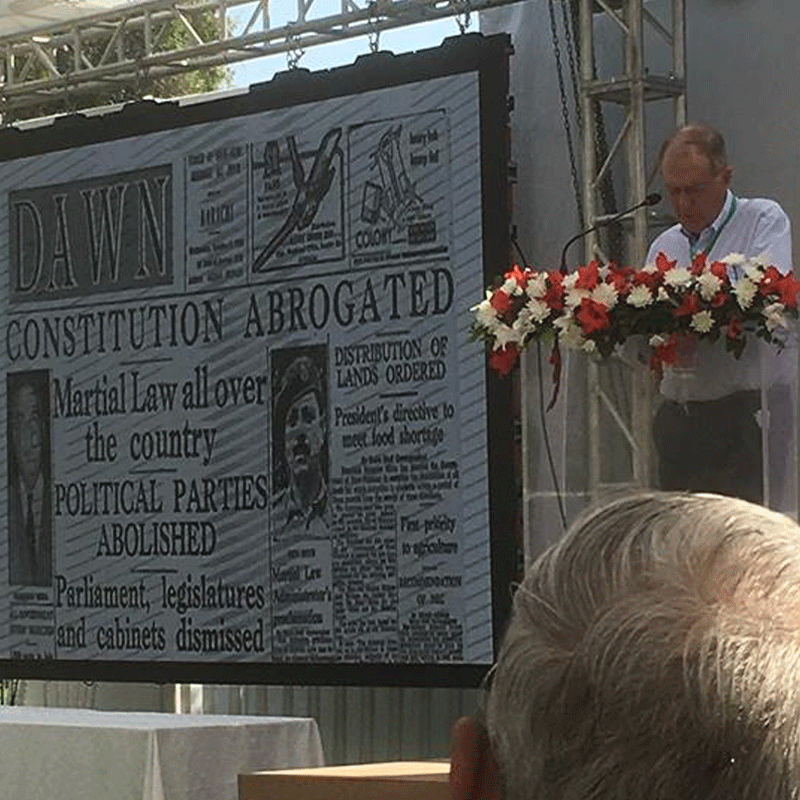 He recalls that the Ayub Khan rule turned everything on its head and how political party leaders had been detained during the military coup. Mohammad Hanif asked for a moment's silence in honour of PTM senior member Arman Loni who was tragically killed this weekend. 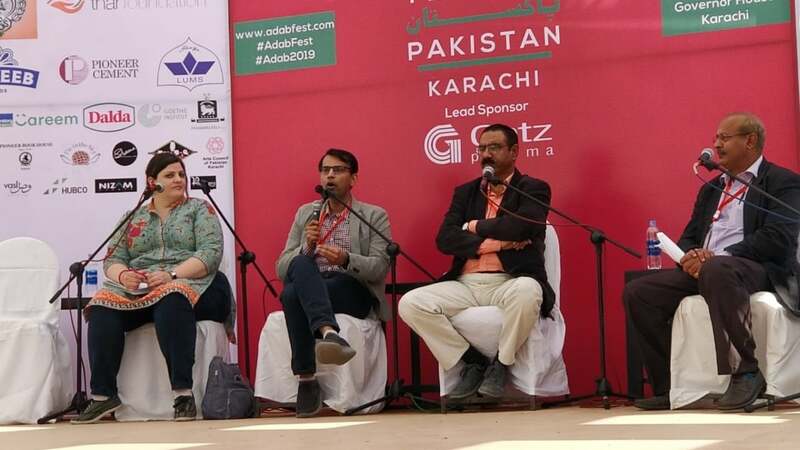 Author Syed Kashif Raza revealed how he "had no idea I was writing a novel, I just kept writing and then there came a point when I felt it could be a novel and I asked a few of my friends and they agreed with me." 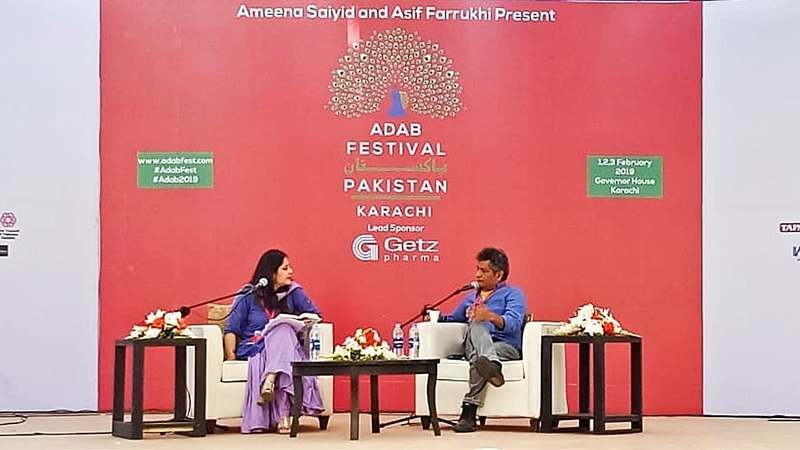 His inspiration comes from western fiction, he says his writing is heavily influenced by it, but also by real life events, like that of Benazir Bhutto's murder. "It was easier to write on existing events like Benazir’s killing. I wasn’t on duty that night, but coincidentally I happened to be reporting that day even though I am not reporter. I put that down in my novel with more fictional content to spruce it up." Author Ayesha Khan said that she started working on this book five years ago. "It's for the younger generation to highlight the struggles women went through for their rights. Most work has been produced by activist since the '80s but has since gone out of print because of negligence." But mostly, she says that the work is focused on WAF and its journey. Amar Sindhu said that the book "is a great contribution to the women’s movement. There is no documented record of the activism that led to the women’s movement. Before Zia the involvement of women in the social and political space was not considered a big deal, but after him women’s involvement in public lessened. He included Islam in the system because he wanted to lessen the involvement of women in public spaces." She added that the book should also include women's movement from a social, political and feminist lens. Panelist Anis Haroon also agreed with Amar and said, "When the Hudood Ordinance came out in 1979 women didn’t know what kind of negative impact it would have in our lives. We felt that if we didn’t speak up then then our country would become Saudi Arabia. Women who were locked up for Zina were the underprivileged. Our struggle was for common woman. We challenged Zia, we asked for the restoration of the 1973 constitution, this was in 1981. We used to openly talk about the Blasphemy Law, we used to go against the Ahmedi prosecution, but you can’t do that anymore." She added, "There’s a gap between the younger and older feminists," and what that fight for freedom means for them and what it meant for the older generation. She said that younger activists are more concerned about personal freedom and things like khana khud garam karlo, who will take care of the kids, what they wear etc. However, Sheema Kermani corrected her. "Fighting for rights is not only about fighting the State. What [younger generations] are saying at the Aurat March and the slogans they’re saying are also challenging the State and fighting the patriarchy." Uzma Noorani rightly highlighted the murders of activists like Sabeen Mahmud, saying that "We’re living in dangerous times and if we try to raise our voices we may get killed so we need to be smarter about how to go about things." 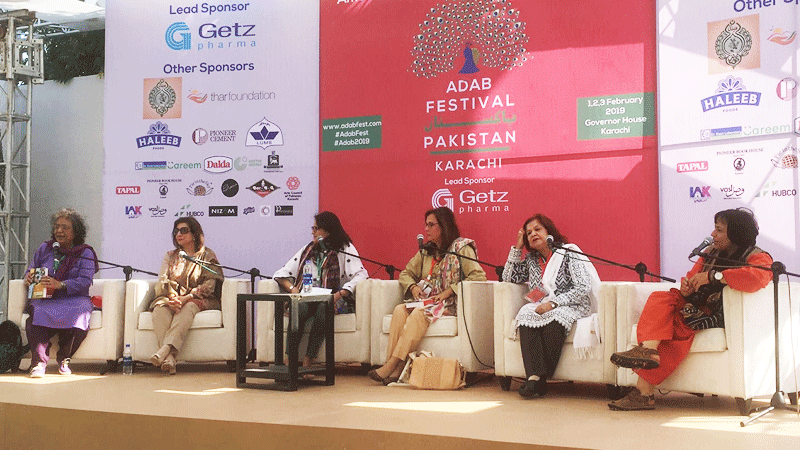 Media's role plays a pivotal role in activism and Sultana Siddiqui of the HUM Network said: "In activism it's very important for the media to be a part of it. When I started my channel I made sure that there was an aspect of entertainment as well as activism." The session talked about how the Islamic tradition can help us to deal with exile and alienation as well as the origins of and recent developments in German public discourse. Weidner said that people with Islamophobia in Germany tend to "rationalise their hate towards Islam by saying it's a backward religion." They think that it's impossible to live with Muslims who believe in the Quran. "The wave for the movement against Muslims is moving up too as a reactionary," he added. "Anti Islamic and Islamophobic sentiments are prevalent in England, France, Germany. It’s dangerous, we have to be on alert and we have to fight. We need to break the boundaries and create bridges." "The minority is Muslim and they don’t have a voice [in Germany] due to which Germany thinks like that and nobody contradicts what is being said about them [Muslims]." Educationists Suleman Shahid, Inam Nadeem and Zahid Hassan spoke with Gwen Kirk about creating an interest in regional languages among university-going students. Zahid Hassan revealed that his Punjabi and Urdu creative writing courses are a hit among students at LUMS and at times, the class has to split into different sections to accommodate the high demand. He said that he's not surprised at the interest given that no Pakistani film nor song is complete without Punjabi. Zahid Hassan, who teaches Punjabi at Habib University in Karachi, said that languages aren't taught in isolation. "Acquiring a language comes with a familiarity of the associated culture and traditions," he said, "which is one of the beauties of learning a new language." Suleman Shahid shared some insight about using technology to promote regional languages, saying that technology can be used to preserve and disseminate the existing syllabi and course materials, as well as creating new content and using blended learning to encourage learning. 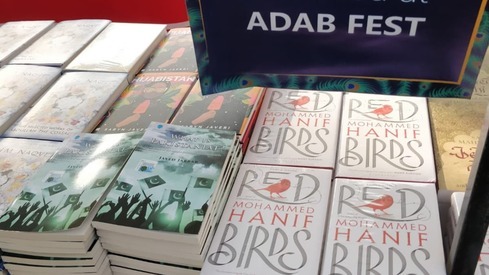 Saira Shah Halim interviewed Hanif about his latest novel, Red Birds. As expected, it was quite a packed session. 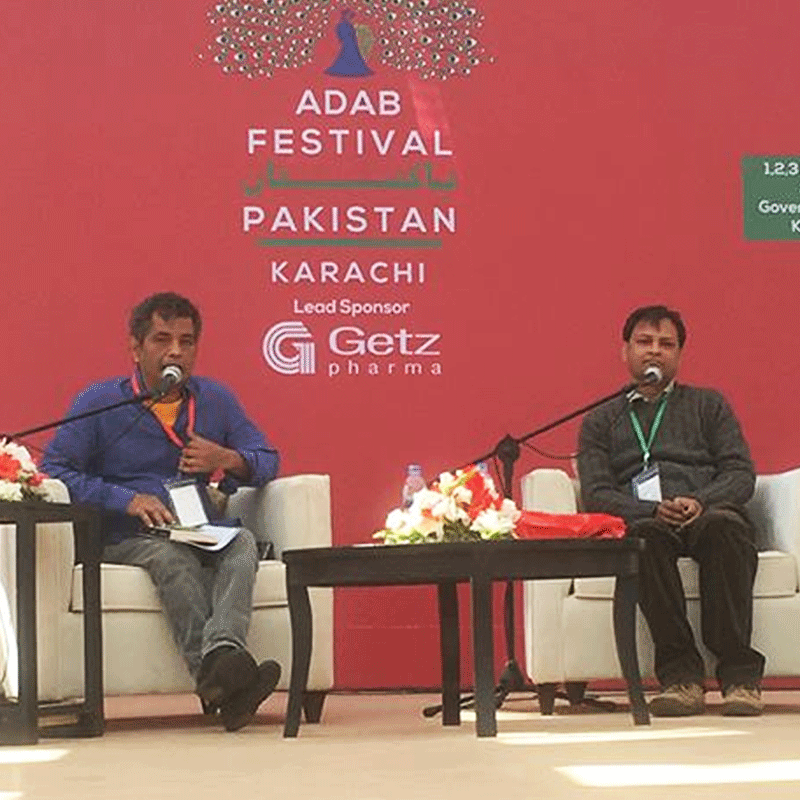 It was a full house at #MohammadHanif's session at the #AdabFest. Did any of you attend It? A moment's silence was observed in honour of photographer Madiha Aijaz after her sudden passing on Saturday. Salima Hashmi says, "Younger artists are rejecting the idea of a gallery they can use any space for art and invite people to enjoy it. Another important change that has taken place is that text has become an important part of art making." 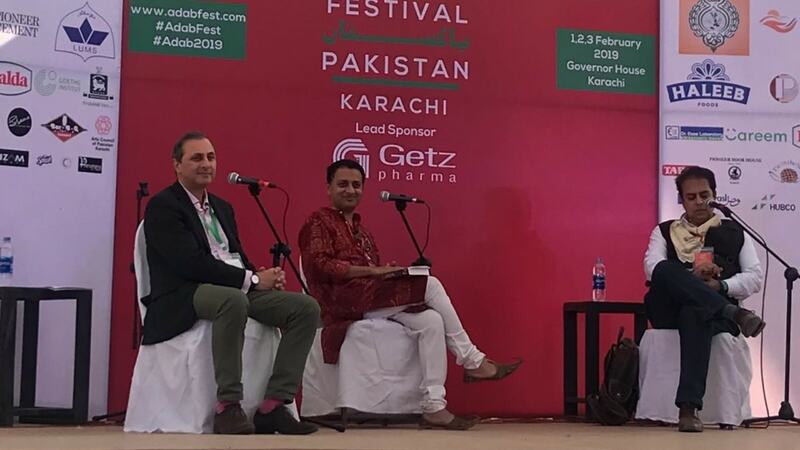 Writers Peter Osbourne and Richard Heller (who wrote a couple of chapters of the Wounded Tiger: A History of Cricket in Pakistan) spoke with great fondness about Pakistani cricket in this session. Heller said Wounded Tiger was the reason for his first trip to Pakistan. He recalled that he took a train from Karachi to Lahore and "every time I looked out of the window there was a game of cricket was being played." He also said throughout Pakistan, "I kept encountering stories I wouldn't have dared to put in a fictional novel." "Cricket is a game that has a tremendous inner life. We see it more vividly in Pakistan cricket, where the internal drama is closer to the surface. That's why it's such a pleasure to watch." 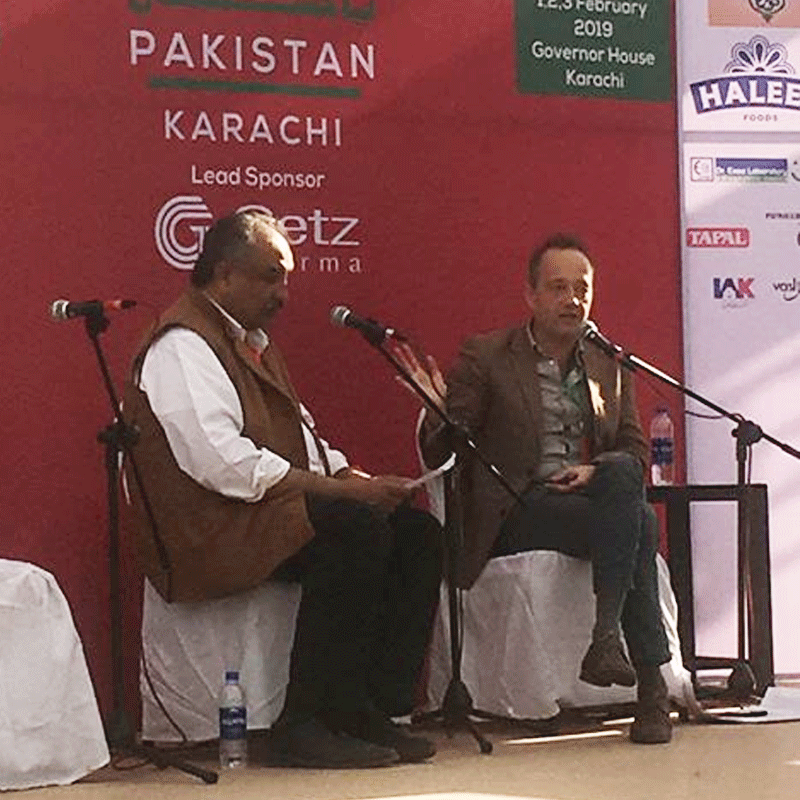 Talking about the dearth of cricket writing in Pakistan. 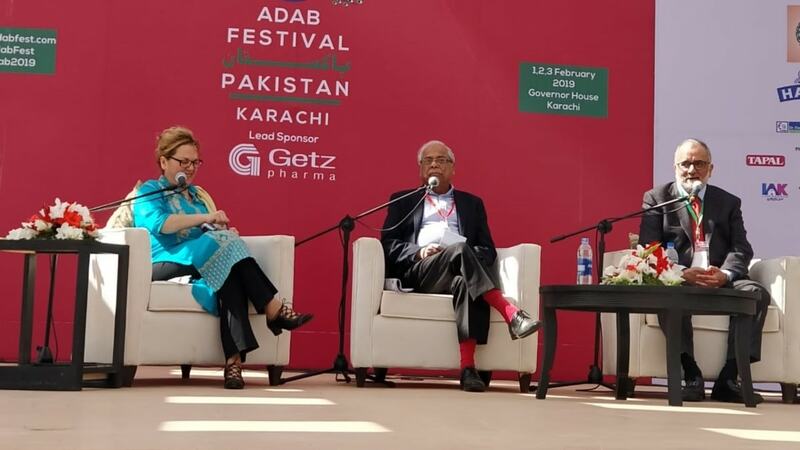 veteran sports journalist Qamar Ahmed said, "Unfortunately, not many publishers in Pakistan are willing to pay writers for their books, most books are self published. So people are not encouraged to write about cricket, politics, economics or anything else." When asked about when he think sinternational cricket will return to Pakistan, Osbourne said that he believes cricket is already back with the West Indian women cricket team playing in Karachi. There's lots of goodwill from many countries with the exception of Australia. But Australia is difficult even in England, he said. Shafaat Ali joined the author Maheen along with surprise guests, Sarwat Gillani and husband Fahad Mirza. While we joined the talk late and by that time, Fahad was reading from the book, we couldn't help but fawn over Sarwat G's Pink Tree Company sari complete with poetry by Zehra Nigah! OF COURSE #SarwatGillani wore a text print sari to the #AdabFest yesterday! Three lawyers turned writers, Farooq Bajwa, Saif Mahmood and Osama Siddiqui sat down to discuss the latter's book, which is a troubling and critical exploration of Pakistan's judicial system. After all, like Siddiqui says, "We’re all lawyers here yet we’re all trying our hand at other things. What does that tell you about the state of our legal system? Saif writes about intellectual history and poetry of Delhi, Bajwa just published a book on foreign policy and I’m also an author now too." Osama said that as one of the custodians of the law, he considered his duty to "spill the beans" and eradicate the "alienation the common man feels with the law" while shining a light on the complexities of "post colonial" legal reform or lack thereof.